City Gate condos 2 (East Tower) was the second tower in the Mississauga Square One area to be sold, built and registered by Toronto developer Davies-Smith. This east tower of the City Gate development was completed by Davies-Smith in 2008, and it followed the successful completion of the initial west tower named City Gate 1. 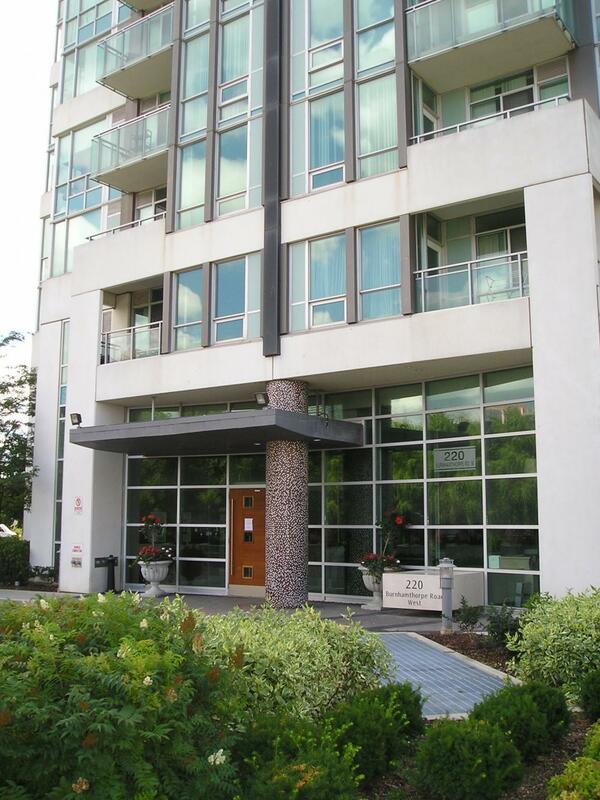 City Gate 2 was eventually followed by a third tower named Solstice at 225 Webb Drive, and finally the fourth and final tower – Onyx at 223 Webb Drive. The second City Gate tower was designed by Roland Rom Colthoff of Quadrangle Architects, and when it first came on the market, it was honored with several industry awards for excellent design. City Gate phase 2 condominium continues with the distinctive angled shape of the first tower – with a very attractive green coloured cladding. It is situated on the north east corner of a city block that it shares with the other three Davies-Smith towers. The massive Square One shopping centre, Ontario’s largest mall, lies immediately to the north, across Burnhamthorpe Rd. This second City Gate condo consists of a single 34 storey high rise tower that is surrounded by a 5 storey podium that joins seamlessly with the first tower’s podium. City Gate 2 tower’s municipal address is 220 Burnhamthorpe Rd. 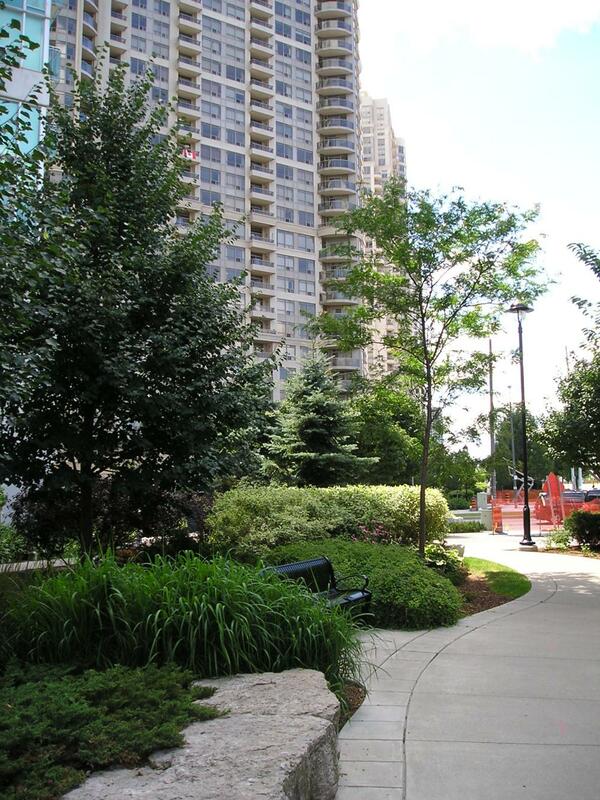 W.
This second City Gate condo is part of the recent boom of luxury highrise condo towers that were built in the centre core area of Mississauga that surrounds Square One Shopping Centre. Being located in such a central location, City Gate is very close to all that the Square One area has to offer: Square One Mall, with its 360 stores and services, is about a 4 minute walk away, with the southwest entrance to the mall (The Bay) closest. In addtion to the mall, Celebration Square with its full slate of community events, fountains, and skating rink in winter, Mississauga City Hall, the central YMCA, the Mississauga central library, Sheridan College, the Living Arts Centre, and the Mississauga Transit and GO bus terminal are all within a few minutes walking distance. For commuters and families, City Gate 2 is also within walking distance of the Cooksville GO station, as well as schools such as Father Goetz Catholic Secondary School, and T.L. Kennedy Public Secondary School. There is also nearby access to the 403 highway, as well as a short drive south to the QEW highway. There are several nearby grocery stores: the newly opened Whole Foods located on the north side of the mall, the full grocery located in Walmart at Square One, nearby Metro store at Mississauga Valley Blvd., a discount store named Great Canadian located on Confederation Parkway, and T&T asian supermarket at Grand Park Ave. In addition to all these options, there is also a 24 hour food market located next door at Solstice condo. Additional retail and offices are also located next door at Solstice, as well as in the podium of City Gate 2 itself. City Gate 2 shares an abundance of amenities with its sister tower City Gate 1. As with most of the condos built during the recent boom, the builders of these two towers have gone to great lengths to provide residents with a wide array of topnotch amenities. City Gate 2 features generous facilities for residents and their guests – with meeting and party rooms, rooftop lounge with BBQ area, an indoor pool, whirlpool, sauna, exercise room, and a gym, plus even a car wash bay in the parking garage. City Gate 2 also features close access to several nearby city parks. One of the best is Kariya Park, which was originally given to the City of Mississauga by the City of Kariya, Japan. This excellent city park, with its tranquil Japanese gardens, is situated only a couple of minutes walk away. Its popularity as a site for wedding pictures illustrates the beauty of this location. In addition to Kariya Park, there is nearby Mississauga Valley park, which is about a 10 minute walk away. It has baseball & soccer fields, extensive BBQ areas, forested creek with plenty of wildfowl, and water splash pads for children. There is also major parkland facilities and public tennis courts at nearby Zonta Meadows, as well as a new Community Park in the area directly to the west of Square One. On the north side of City Gate there is a winding pathway that parallels Burnhamthorpe Rd. W., that is nicely landscaped, and it is a popular area for dogwalkers and nature lovers. Along this path, you will find benches, artwork, and elaborate landscaping. 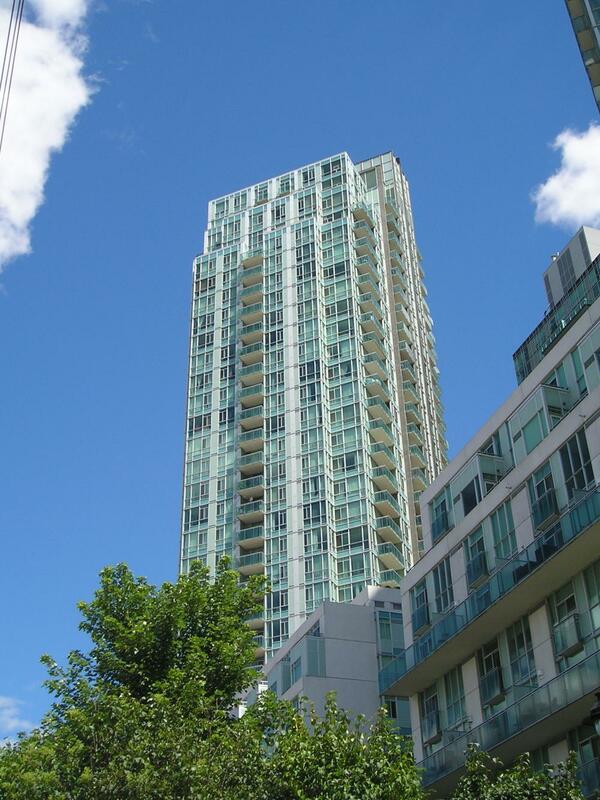 Throughout the condo, individual units have open balconies, many with excellent views of the other towers of downtown Mississauga, plus views of downtown Toronto and the CN Tower, and even across Lake Ontario. There is a mixture of apartment types, ranging from bachelor studios to 2 bedroom plus dens, as well as a good selection of 2 storey lofts on the north face of the building. Address: 220 Burnhamthorpe Rd. W.